The ocean represents the largest reservoir of carbon in the global carbon cycle (see Col-orplate 1 of Sabine et al., Chapter 2) and has taken up approximately 30 percent of the total anthropogenic emissions since the beginning of the industrial period, constituting the second-largest sink of anthropogenic carbon after the atmosphere itself (Le Quere and Metzl, Chapter 12; Sabine et al., Chapter 2). Therefore, relatively small changes in the oceanic reservoir and its current sink activity may have a large impact on the future trajectory of atmospheric CO2. On millennial timescales, more than 95 percent of the anthropogenic CO2 will be taken up by the ocean (Archer et al. 1997). On timescales of decades to centuries, however, this large sink potential can be realized only to a limited degree, with the rate-limiting step being the transport of the anthropogenic carbon from the surface into the interior of the ocean (Sarmiento et al. 1992). Because the primary driving force for the oceanic uptake of anthropogenic CO2 is the atmospheric CO2 concentration, the magnitude of the oceanic sink in the 21st century depends on the magnitude of the atmospheric perturbation. In the absence of major feedbacks, paradoxically, the higher the anthropogenic CO2 burden in the atmosphere, the higher the oceanic sink is going to be. Throughout the anthropocene, the oceanic uptake of anthropogenic CO2 has scaled nearly linearly with the anthropogenic perturbation of atmospheric CO2 (Gloor et al. 2003) (0.027 ± 0.008 PgC y-1 ppm-1). This is because the atmospheric CO2 so far has grown quasi exponentially, and the rate-limiting process is linear. This scaling cannot be extrapolated far into the future, as the atmospheric growth rate may change sub stantially. More important, this scaling is expected to decrease over time as the continued uptake of CO2 by the ocean decreases the oceanic uptake capacity for a given change in atmospheric CO2 (Greenblatt and Sarmiento, Chapter 13, this volume). Using this linear scaling and projected atmospheric CO2, we estimate the maximum oceanic sink potential for the next 20 years in the absence of climate change to be on the order of 60—80 PgC. This estimate compares well with estimates from ocean models that were forced using the IS92a scenario (Watson and Orr 2003). The maximum oceanic sink for the next 100 years is more difficult to estimate as it depends strongly on the atmospheric CO2 level attained. If we adopt 1,000 ppm as the upper envelope, the cumulative ocean uptake over the next century, in the absence of climate change, might approach 600—700 PgC. In the case of the stabilization scenarios, the oceanic sink is going to be substantially smaller, as the slower growth rate and the smaller atmospheric CO2 burden both lead to a reduction in the uptake. How sensitive is this oceanic sink to natural and human-induced changes over the next 20 to 100 years? Greenblatt and Sarmiento (Chapter 13, this volume) review and discuss several detailed studies on the basis of coupled atmosphere-ocean models. Plattner et al. (2001) provide a very detailed analysis of the nature and magnitude of the various feedbacks using a model of intermediate complexity. The goal here is to put these results in perspective by analyzing and assessing the pools and processes that might become at risk in the 21st century from a systems perspective. It is thereby instructive to differentiate between the factors that affect the physical/chemical uptake of anthropogenic CO2 and those that change the natural carbon cycle in the ocean. The former feedbacks are associated with the anthropogenic CO2 perturbation in the atmosphere, whereas the latter feedbacks are independent of the anthropogenic CO2 changes in the atmosphere and arise because of changes in climate and other factors. Table 3.2 gives a summary of the six feedbacks that can either accelerate or decelerate the flux of carbon from the atmosphere into the ocean. Medium/medium Extremely high/low tion (see also Yi et al. 2001). This positive feedback is fully implemented in ocean carbon cycle models and therefore seldom explicitly discussed. Still relatively well understood but more difficult to quantify is the potential impact of ocean circulation changes on the uptake of anthropogenic CO2. Current climate models tend to show that the warming of the surface ocean, together with a decrease in high latitude salinity as a result of increased precipitation, will lead to a reduction in the surface ocean density relative to that of the underlying waters, thereby increasing vertical stratification. Such an increase in stratification will lead to a reduction of the exchange of surface waters with deeper layers, reducing the downward transport of anthropogenic CO2 and hence reduce the oceanic uptake of anthropogenic CO2 from the atmosphere (Sarmiento et al. 1998). Less well established is the impact of climate change on deepwater formation rates and the meridional overturning circulation (Greenblatt and Sarmiento, Chapter 13, this volume). years, the ocean circulation feedback could probably be up to three to four times as large, reducing the oceanic uptake of anthropogenic CO2 by up to 40 percent, with the absolute magnitude depending on the size of oceanic sink. Our estimate here is quite a bit larger than the model-based estimates of 3 percent to 21 percent (Sarmiento and Le Quere 1996; Sarmiento et al. 1998, Joos et al. 1999; Matear and Hirst 1999; Plattner et al. 2001; see summary by Greenblatt and Sarmiento, Chapter 13) mainly because we assumed a larger change in stratification than was simulated by these models. 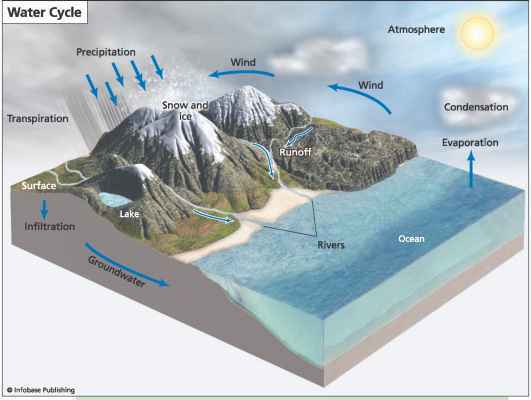 The temperature, salinity, and circulation changes already discussed not only influence the uptake of anthropogenic CO2, but also affect the natural carbon cycle within the ocean, as well as the vast quantities of methane hydrates that are stored along the continental shelves. We look at these changes in turn, focusing first on the individual effects and thereafter at their interactions. The amount of dissolved inorganic carbon (DIC) in seawater for a given atmospheric partial pressure and ocean total alkalinity is highly temperature dependent, with a reduction of about 8 millimoles (mmol) per cubic meter (m-3) in DIC for each degree of warming. Therefore, assuming a maximum surface ocean warming of 2°C and a 0.5°C warming over the upper 300 m in the next 20 years would lead to an equilibrium loss of about 15 PgC. Similarly, we estimate that a maximum surface warming of 5°C and a 2°C warming over the upper 1,000 m over the next 100 years would lead to an equilibrium loss of carbon into the atmosphere of more than 150 PgC. These warming-induced losses represent about a 20 percent reduction in the net oceanic uptake for atmospheric CO2. Models generally find a smaller magnitude of the temperature feedback with a reduction of the order of 50-70 PgC (10-14 percent) over the 21st century (Greenblatt and Sarmiento, Chapter 13, this volume), mostly because their warming is smaller than the magnitude we assumed. Changes in surface salinity also have the potential to alter the ocean atmosphere distribution of inorganic carbon, on the one hand through changes in the solubility of CO2 and on the other hand through changes in surface ocean alkalinity (dilution effect). We consider the salinity feedback to be a minor factor on the global scale for the 21st century, as we expect relatively small changes in global mean surface salinity, an assessment shared by the model simulations of Plattner et al. (2001). The increase in vertical stratification and the other circulation changes not only reduce the uptake of anthropogenic CO2 from the atmosphere, but also affect the natural carbon cycling substantially, even in the absence of any changes in ocean productivity. An important distinction between this circulation feedback and that associated with the anthropogenic CO2 uptake is that the latter feedback affects only the rate at which the atmospheric CO2 perturbation is equilibrated with the ocean and does not change the long-term equilibrium, whereas the former feedback changes the equilibrium distribution of carbon between the ocean and atmosphere. As it turns out, in the presence of the biological pumps, these circulation changes appear to lead to a negative feedback—that is, an increase in the uptake of atmospheric CO2 from the atmosphere. The main reason for this somewhat surprising result is that a slowdown of the surface to deep mixing also reduces the upward transport of re-mineralized DIC from the thermocline into the upper ocean, while the downward transport of biologically produced organic carbon remains nearly unchanged. To estimate the magnitude of this feedback, we assume that global export production by particles remains at about 10 PgC y-1 and that the upward supply of DIC to compensate in the steady state for this downward organic carbon transport changes inversely proportionally to the increase in vertical stratification. Adopting our previously estimated changes in surface stratification (10 percent over the next 20 years and 40 percent over the next 100 years), we estimate the cumulative reduction in the upward supply of DIC to be 20 PgC over the next 20 years and 400 PgC over the next 100 years. Not all of this reduced supply of DIC will be compensated for by an additional uptake of CO2 from the atmosphere. Model simulations suggest that this ratio is about half, leading to an estimate of this negative feedback of about 10 PgC over the next 20 years and about 200 PgC over the next 100 years. The model simulations summarized by Greenblatt and Sarmiento (Chapter 13) suggest a range from 33 to more than 110 PgC over the anthropocene. They also show that the models that have a larger positive circulation feedback associated with the anthropogenic CO2 uptake tend to have a large negative circulation feedback associated with the natural carbon cycle. This result is not unexpected, as the two feedbacks are tightly linked with each other. The marine biota affects the cycling of carbon in the ocean in two fundamentally different ways. One is through the formation of organic matter in the surface ocean by photosynthesis and the subsequent export of this material into the ocean interior (soft-tissue pump), and the other is through the biogenic formation of CaCO3 shells in the upper ocean, which also tend to sink and dissolve at depth (carbonate pump) (see also Sabine et al., Chapter 2). We will first focus on the soft-tissue pump, because it is quantitatively more important, and discuss the carbonate pump thereafter. The pool of organic matter in the ocean is small, but most of it turns over on timescales shorter than a year. As a consequence, when considering the impact of climate change on the natural carbon cycle and in particular ocean biota, it is insufficient to look at the pool size of organic matter in the ocean. Instead we have to focus on the time-integrated effect of ocean biology on the oceanic DIC distribution, in particular, the fraction of the surface-to-deep gradient in DIC in the ocean that is induced by the soft-tissue pump. Gruber and Sarmiento (2002) estimated that about 50 percent of the surface-to-deep gradient in oceanic DIC is due to the soft-tissue pump (about 150 micromoles [^mol] kg-1). Integrated over the global ocean, this inorganic carbon pool of biological origin amounts to about 2,500 PgC. Because the ocean CO2 system is strongly buffered, we estimate that only about 10—20 percent of this "biological" carbon comes from the atmosphere, with the remainder coming from the oceanic DIC pool. As a consequence, only a fraction of any loss from this biological DIC pool ends up changing atmospheric CO2. Model simulations suggest, for example, that a complete die-off of ocean life would lead to an atmospheric CO2 increase of about 150—200 ppm only (300-400 PgC) (Gruber and Sarmiento 2002). The biological pump in the ocean does not operate at full strength, however, as there are many regions where surface nutrients are not entirely used. Only about half of the global nitrate pool is currently associated with the biological carbon pool, offering the possibility of almost doubling the biological DIC pool to about 5,000 PgC. If we assume again that about 10 percent of this carbon comes out of the atmosphere, we find that the absolute upper and lower bounds of how changes in organic matter export can influence atmospheric CO2 are on the order of ± 250 PgC, an estimate consistent with the recent model simulations by Archer et al. (2000). The fraction of the change in the biological DIC pool that shows up in the atmospheric CO2 pool appears to be highly model dependent, for reasons not fully understood (Archer et al. 2000). As very little is known about the sensitivity of marine export production to climate change, estimating how it might change over the next 20-100 years is by necessity very uncertain. Our estimates, therefore, must be viewed with caution. It is nevertheless instructive to determine possible upper bounds and to put them into perspective with the other pools and processes that might change atmospheric CO2 in the 21st century. Over the next 20 years, we estimate that global export production will not change by more than about about 3 PgC y-1 (25 percent). This estimate would lead to a maximum change in the biological carbon pool of about 60 PgC (4 percent), which would lead to a change in the atmospheric CO2 pool of only about 6-12 PgC. There are many possible reasons for changes in global marine export production, including changes in surface ocean physical properties, changes in the delivery of nutrients from land by rivers and atmosphere, and internal dynamics of the ocean biota, including complex predator-prey interactions and fisheries-induced pressures on marine predators (see Boyd and Doney 2003 for a comprehensive review). Over the next 100 years, we estimate that the maximum change of the biological carbon in the ocean is likely less than about half of the total pool or maximally about 800 PgC. Taking into account the century timescales for this perturbation in the biological pool to equilibrate with the atmosphere, we believe that the maximum change in the atmospheric CO2 pool over the next 100 years due to this effect is about 100 to 150 PgC, or of a magnitude similar to the glacial-interglacial CO2 changes. There exist possibilities for surprises, though, as our understanding of the mechanisms controlling marine productivity and the subsequent cycling of organic matter in the ocean is limited. For example, while marine export production is generally believed to be controlled primarily by the supply of nutrients and the availability of light (bottom-up control), grazing pressure (top-down control) also plays a major role. With the enormous fishing pressure on the top predators in the ocean, marine foodwebs have already been altered fundamentally in many regions (Jackson et al. 2001) and are expected to change further. On the basis of our current understanding, this human-induced change in foodweb structure should have a relatively small impact on global marine export production, but not enough is known today to exclude the possibility for a bigger role. We next turn to the impact of climate change on the carbonate pump. Gruber and Sarmiento (2002) estimated that the surface-to-deep gradient generated by this pump amounts to about 60 |mol/kg, giving rise to a calcium carbonate (CaCO^) pump-induced DIC pool in the ocean of about 600 Pg. The effect of changes in this pool on atmospheric CO2 depends on the timescale considered. On timescales less than a couple of hundred years, an increase in this pool size tends to increase atmospheric CO2. This increase is because the formation of CaCO^ lowers the alkalinity of the surface ocean more than it lowers DIC, thereby reducing the buffer capacity of the ocean. On very long timescales, this effect is counteracted by interactions with the ocean sediments (Archer et al. 1997). Therefore, if changes in the export of CaCO^ from the surface ocean are proportional to the changes in the export of organic matter (a constant rain ratio) as expected—for example, if CaCO^ plays an important role as a mineral ballast (Armstrong et al. 2002; Klaas and Archer 2002)—this process would have a counteracting effect on atmospheric CO2 changes. Conversely, if the formation and export of CaCOj was a process that is very independent of the export of organic matter, then the two processes could reinforce each other, leading to a larger ocean biota feedback. One example of how the production and export of CaCO^ could be affected is through changes in pH. There is increasing evidence that the calcification rate by coccolithophorids (the dominant class of phytoplankton that produces CaCO^ shells) might be significantly reduced in response to a lowering of the surface ocean pH (Riebesell et al. 2000). As a reduction of calcification leads to an increase in the ocean uptake capacity for atmospheric CO2, this represents a negative feedback for climate change. Zondervan et al. (2001), however, estimated the magnitude of this effect to be on the order of 10-20 PgC only for the 21st century. A lower pH also affects the calcification rates of corals (Gattuso et al. 1998; Kleypas et al. 1999). This effect, together with the enhanced sea-surface temperatures, poses a significant threat to coral reefs. The impact will likely be relatively small on atmospheric CO2 but could be very large on ecosystem services such as fish recruitment, biodiversity, and tourism. Vast quantities of methane, exceeding all known fossil-fuel reserves, exist in the form of methane hydrates. These occur primarily under continental shelf sediments around the world and in the Arctic permafrost. Hydrates are a crystalline solid of gas trapped in a frozen cage of six water molecules. Geologic evidence suggests massive releases of methane from the ancient sea floor, associated with episodes of global warming (Dickens et al. 1997). Such events can trigger very large undersea landslides and associated tsunamis. Could such a large-scale release happen over the next 100 years? The mechanisms associated with gas hydrate instabilities are very poorly understood, but calculations of heat penetration into sediments suggest that the probability is very low. Are the various feedbacks described here additive, or is it possible that some of these feedbacks interact with each other to create synergies? The ocean biota feedback and the ocean circulation feedbacks are tightly coupled, because ocean circulation is a prime determinant of marine productivity, mainly because circulation controls the resupply of nutrients from the deep ocean to the light-lit upper ocean. This resupply of nutrients is also coupled with the resupply of the carbon that is associated with the biological pump. Therefore, while a decrease in the supply of nutrients (such as caused by an increase in upper ocean stratification) tends to cause a decrease in marine export production (positive feedback), at the same time it decreases the resupply of the carbon associated with the biological pump (negative feedback). As a consequence, there is a strong tendency for the two processes to counteract each other, with the sign of the combined feedback being very uncertain (see Greenblatt and Sarmiento, Chapter 13, this volume). In contrast to the nutrient-limited regions, the expected increase in vertical stratification would create a tendency to increase export production in light-limited regions such as the high latitudes. On the basis of nutrient-light-circulation interactions alone, one would expect a relatively small change in global export production but large regional changes, similar to the results of Bopp et al. (2001). Many other interactions, however, might occur (e.g., associated with the delivery of iron and interactions with community structure) that make it nearly impossible to make accurate projections now. Despite all these uncertainties, the circulation feedback and the ocean biota feedbacks appear to be generally additive. Reviewing the currently available literature, we are not aware of any strong nonlinear interactions between the various feedbacks, so the net oceanic response to the anthropogenic CO2 perturbation in the atmosphere can be understood from the sum of its parts. Table 3.2 summarizes the six feedbacks that we discussed.